Sorghum is a one year plant of the Roaseae family which is classified under millet grains and it includes about twenty subspecies. Some of these species are grown as wheat for human consumption and some are grown in the pastures for cattle grazing. The sorghum plant has some resemblance to corn. 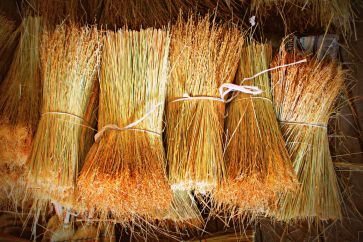 It however does not form a cob like corn but a brush, which is most important for the production of brooms. Sorghum possesses a great ability to adapt to different climates, day lengths and lighting and soil conditions. It is a tropical weed that usually grows freely in regions with semi-arid climate, especially in Africa, India and some other regions in Asia. 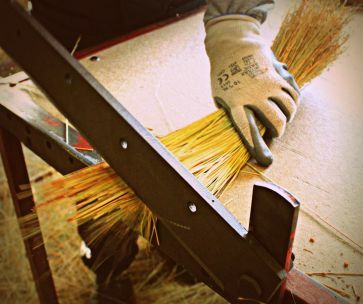 Sorghum that we use in the broom industry is grown in the region called Vojvodina. Sorghum has special demands which are connected to the region in which the production takes place. A great challenge in the choice of the location is the need for warmth. The temperatures needed for germination go from 12 to 14 °C. These temperatures of the soil are usually manifested during the end of April and the beginning of May in this region. Highest growth of the plant is achieved with air temperatures from 27 to 32 °C. During the vegetation period sorghum goes to dry hibernation but is quickly revitalized and continues its growth as soon as some moist gets to the soil. This is the fundamental difference between sorghum and other plants which get damaged or have quickened maturation during the periods of drought. Sorghum is a one year plant. It is used in nutrition but also as hay, also for acquirement of starch, alcohol and glucose. 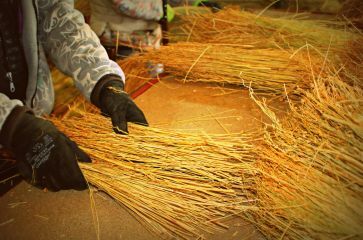 Its other uses are building material, non gluten food and in the biogas and ethanol industry, where the whole plant is processed. In food industry the sorghum seed is used as a base for syrup, for mash (because it has no gluten), also for bread and for sorghum beer. Sorghum beer is very popular in Africa and America. High tannin content gives it a bitter taste. Other liquors are also produced from sorghum like wine and spirits. In Africa, India and other regions in Asia sorghum seed has a vital part in human nutrition. Sorghum is the fifth most important plant culture in the world, right behind wheat, corn, rice and barley. It is grown mostly between 40 degrees north and 40 degrees south of the Equator.